Seward shot their way to a 20 point win over the banged up Butler Grizzlies Wednesday night in the Green House. The Saints made 8-13 three pointers in the first half and 12-22 for the night in a 101-81 win over last year’s Jayhawk West champs. 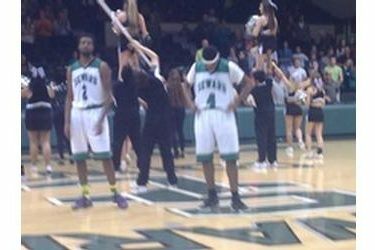 Seward made 52 percent of their shots and 81 percent of free throws. The Saints had six players score in double figures. Charles Beauregard led the way with 22 while Marcus Mathieu scored 17 with six rebounds, Niem Stevenson had 16 with seven rebounds, Delano Jones fought off foul trouble with 15 points, James Byrd had 14, and Mitchell Packard scored 13. Seward led the game 48-39 at halftime and led by as many as 25. It was Seward’s first win over Butler since February of 2013. The #15 Saints are 13-1 and 3-0 in the KJCCC while the Grizzlies are 9-5 and 1-2 in the Jayhawk. Seward hosts Pratt Saturday night at 8 on B107.5 and kscbnews.net. Billy’s/Ayr Lanes is the buyout sponsor.